This year I’ve found myself reading a bunch of books about the mind, the brain, and the nature of the self. For some reason I’m reading them all in parallel, picking one or the other depending on how I’m feeling on any given day, which is probably why I haven’t actually finished any of them yet. I’m loving them all, in different ways. I could probably do with spending more time talking to people about all this stuff, as well, which is one reason I’m posting this now rather than waiting till I’ve finished the books to write about them (although I will probably do that, too). Here are a few words about what’s in the Mind/Brain section of the towering pile on my bedside table right now… Does anyone else have any thoughts about any of these, or interest in discussing them? I don’t know why it’s taken me so long to get round to tackling this book; I’ve known for a long time that Dennett is a very compelling, interesting writer and thinker. I had the feeling that his thoughts about how the mind works have a lot of overlap with my own, but until this year I’d only ever read a few of the essays from his collection ‘Brainstorms’, which is excellent if somewhat repetitious. What surprised me when I finally picked this up was what an entertaining writer he is. I first met Hofstadter’s magnum opus, Gödel, Escher, Bach, when I was a kid – I was probably about twelve years old. I was enchanted, and I it may well have had a more profound influence on my thinking than any other single book, but in spite of that I could never finish it. It’s so much fun to dip into, especially the dialogues; but then its mathematical excursions are so involved, it can be hard to stay with it to the next flight of fancy without feeling like you’re either breaking your head or skimming too much. His later book covers much of the same ground – about the meaning of meaning, and how such a thing could possibly emerge from constituents that seem to obey the mathematical rules of physics – while avoiding most of those pitfalls. It’s dense, but never overwhelmingly so, and it’s just whimsical enough to make you smile without getting waylaid. Damasio is a medical doctor and neurologist by training, and more than any of the other books I have been reading, this one is grounded in science, particularly the study of the human brain. His approach to thinking rightly takes in the whole body, though – he is very concerned with the importance of looking at the whole organism if we want to understand thought, the nature of the self, and particularly emotions. What I find odd is that he has essentially written a whole book about embodied cognition in a book which doesn’t list that term or embodiment in its index; he does briefly name-check Francesco Varela and Maturana, but rather a lot of the time he seems to be writing as if he hasn’t noticed that anybody has ever had similar ideas. His science is impeccable, but I’m thrown by his lack of engagement with existing philosophy. Then again, this is a short book – much the shortest of these four – and I know that some people switch off the moment they see the word ‘phenomenology’. This is probably the least accessible of the books in my stack, but still, the writing is lucid and uses no more jargon than it needs. This book was conceived as a follow-up to Thompson’s book with Varela and Eleanor Rosch, ‘The Embodied Mind: Cognitive Science and Human Experience’, which I haven’t read. Thompson is rounding up relevant thoughts from all over science and philosophy, in order to put together a strong case for thinking about the mind as something arising from life; not something unique to the human brain, but a process naturally arising from and involving any organism – and also, in some sense, extending beyond it. It’s a grand project, and my sense is that it’s a very worthwhile one. This is a pretty fat book, though, written very clearly but without a great deal of levity, so I’m relying on sheer fascination value to carry me through. I think it will. The Cloud Appreciation Society was founded by Gavin Pretor-Pinney in 2004, to ‘fight blue-sky thinking’, with the motto: ‘Look up, marvel at the ephemeral beauty, and live life with your head in the clouds‘: Sound advice if I ever heard it. The Cloudspotter’s Guide is its first official publication, and the author’s first book. Pretor-Pinney also designed the Guide, typeset it and put together the diagrams, and in every case he has done a beautiful job. This volume is gorgeously produced, with a delightful, atmospheric woodcut opening each chapter, plentiful photography throughout (mainly contributed by members of the Society) and the old iconic cloud symbol from the BBC’s weather forecasts serving as a vignette between each section. All in all, the design gives the book a dreamy, flighty air, in keeping with both the subject matter and the style of the prose. The writing is fluid and un-self-consciously eloquent, rambling without ever getting tedious, educational without ever getting lecturey. The author skips amiably from topic to topic, interweaving personal and historical anecdotes, scientific observations and poetic ruminations on the beauty and vitality of the skies. 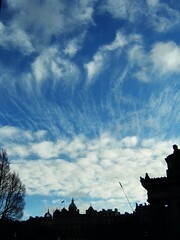 Each of the major classes of cloud has a chapter dedicated to it, always going into some depth about what characterises the clouds in question and talking a little about the meteorology of it, but often spending more time talking about other things – clouds in history and art, say, or various phenomena that come along with the clouds themselves (most of the Cirrostratus chapter is devoted to discussing ice haloes, for example; much of Nimbostratus is about rain from all sorts of different clouds). The beginning of each of these chapters features a summary table for the clouds that are its nominal subject, giving a few illustrative photos, telling you where they form, in what species and varieties they appear, how to distinguish them from any superficially similar clouds, and so on. The scientific details are substantial enough to satisfy the amateur meteorologist in me, but never so technical as to bog down the flow of the writing; where the author has had to simplify to make it comprehensible to the general reader, he is not afraid to say so, and the insatiably curious can always follow his pointers to more in-depth work. After the ten chapters for the main cloud groups, the last section of the book (‘not forgetting…‘) goes onto things which couldn’t quite be fitted in elsewhere. 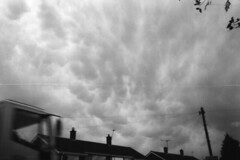 First, there is a chapter on The Other Clouds – accessory clouds such as the pileus (‘like a cloud haircut’) and pannus (‘dark shreds of condensation, which form like ghostly apparitions in the saturated air of rainfall’) which only appear alongside other clouds; supplementary features such as the incus (anvil) that often extends from the top of a Cumulonimbus cloud, or the breast-like mamma clouds that occasionally blob from the bottom of that; and the high, high clouds that form way above more common clouds, up in the mesosphere or the stratosphere – nacreous and noctilucent clouds respectively. Chapter Twelve’s subject is contrails, the trails of condensation that form behind high-altitude aeroplanes.These streaks may provide an interesting glimpse into the process of cloud development, but they are also strongly implicated in climate change; it is largely thanks to them that the contribution of aeroplanes to the greenhouse effect is almost three times as large as it would be if CO2 was the only thing we needed to worry about. Much of the chapter is spent exploring the threat of global warming as it relates to aeroplane exhaust, with a substantial portion also given over to the history and science of cloud seeding – a technology which can be surprisingly effective in inducing rainfall (albeit only when the conditions are right), and which gets discussed oddly rarely considering the power of it. In the final chapter, the author goes into journalist mode to recount in detail his mission to visit the Morning Glory, a spectacular and near-unique cloud formation in northern Australia, where rolls of cloud can be seen stretching from horizon to horizon as they make their way over the outback. Glider pilots come from all over the world to surf on its extraordinary, visibly roiling updrafts, and witness one of the world’s most awesome clouds. Despite the stylistic departure, the story provides a surprisingly elegant close to the book, as the author soars alongside a few of this planet’s most devoted cloud-lovers.